Alexa offers your customers a new way to interface with technology – a convenient UI that enables them to plan their day, control their smart home devices, and access news and information. If you’re already building a voice-forward product with the Alexa Voice Service (AVS), you’ll want to ensure you have the right setup to effectively test your integration prior to launch. Testing your Alexa-enabled product in a variety of scenarios will help ensure that you bring a delightful hands-free Alexa experience to your customers and encourage habitual usage of Alexa capabilities. We recommend a two-phased approach to test your integration: self-tests and then product submission to Amazon. During self-tests, you will complete a series of exercises to ensure your product meets functional and user experience (UX) requirements. If you’re building a far-field device or want to enable certain domains like music, you’ll also want to execute additional testing prior to launch. Before you start, make sure your integration adheres to our Functional Requirements, review our UX Guidelines, and set up your self-test environment. In this blog post, we’ll cover the minimum requirements for a self-test room that you can construct at your workplace. We recommend a room at least 2.5 m x 3.5 m x 2.2 m. These dimensions are in reference to usable space. Look for a room with wall-to-wall carpet and some acoustical damping (ceiling tiles) in the ceiling. If the room has a lot of windows or a large whiteboard, consider covering these with a set of curtains to avoid strong reflections by hard surfaces. We target a reverberation time that is less than 0.7 s and higher than 0.2 s. This is targeted for the frequency range captured by Alexa, between 100 Hz and 8 kHz. For technical specifics we defer to ISO 3382-3:2012. If you are building a test chamber, please consider 10 Hz neoprene isolators and bass trap panels in the corners. To reduce the influence of unwanted noise on your results, the background noise of your test room should be less than 35 dBA. 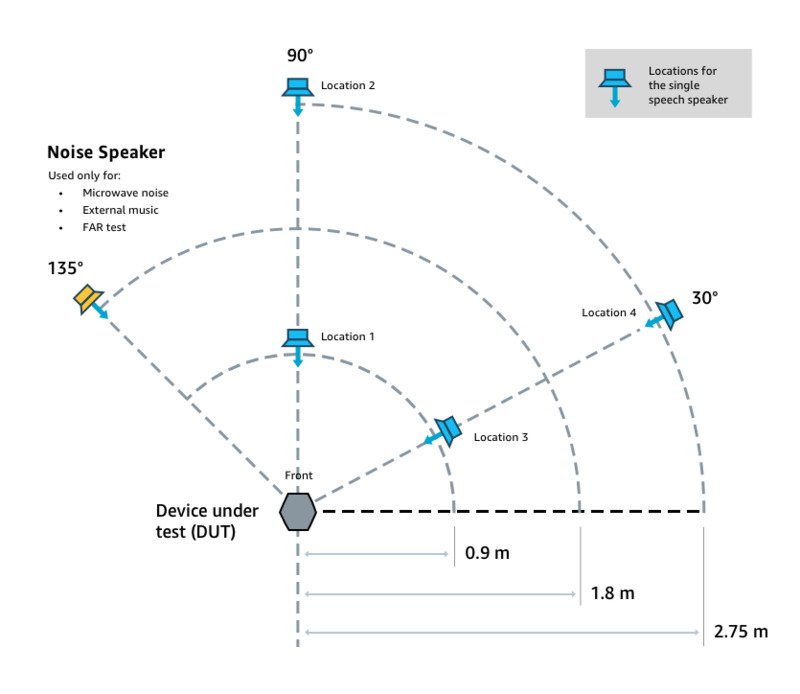 Your setup requires 1 noise speaker, 4 speech speakers, your device under test and at least a 0.5 m clearance between the walls, test speakers, and your device. To control the output of the speech speakers and noise speaker you will want to get a multi-channel sound card, such as the Roland Octa-Capture or RME Fireface. The above image shows the placement and angles to complete testing. After you’ve completed the self-test room set up, you can evaluate your Alexa integration, and correct bugs uncovered during the process. For access to Amazon self-tests and the audio files required for testing, reach out to your Amazon point-of-contact or follow the instructions for how to launch with AVS. Refer to our Product Testing overview for more information on self-tests and how to submit your device for additional Amazon review.